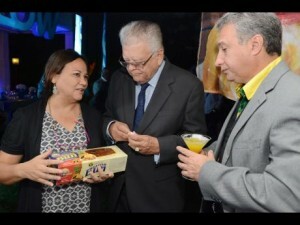 In one of her first official duties, new president of the Jamaica Exporters Association Michelle Chong is seen with Minister of Industry Minister of Industry Commerce & Agriculture Karl Samuda (left), and President of the Jamaica Manufacturers Association Metry Seaga (right) at Thursday’s media launch of JMA/JEA Expo Jamaica 2016, held at The Jamaica Pegasus hotel. Honey Bun’s co-founder and Chief Executive Office, Michelle Chong has been elected president of the Jamaica Exporters Association. She will lead a team that includes Paul Lewis, deputy president; Hernal Hamilton, honorary treasurer; and vice presidents Lisa Johnston, Stephen Dawkins, Natalie Grandison and Roderick Francis. Marjory Kennedy will sit on the board as immediate past president, as will consultant general manager Sandra Glasgow. Up to six additional officers may be co-opted by the new board when it next meets, the JEA said. “We conducted an exhaustive search for someone who would further strengthen our board’s breadth of talent and background, and we are delighted to have identified such an outstanding individual,” said JEA consultant general manager Sandra Glasgow. Chong succeeds Kennedy, who held the post since 2013. Kennedy had also previously served as president from 2006 to 2008. Chong, who was elected Wednesday, is expected to build on programmes aimed at opening up market access for JEA members in much the same way as Honey Bun itself has landed distribution deals of its own. “She has proven to be a successful and trusted leader and brings to this position a strong reputation for developing people and inspiring teams. Her wealth of experience across export markets, particularly in Europe and the United States, will be a valuable asset as we continue to accelerate export growth through our 2020 Vision and our previously announced five-year strategic plan,” the JEA said in a release.